Rugged Mountain RV announces the 2019 Rugged Mountain Granite 9RL, an 8’11” hard side, non-slide, wet bath truck camper for long or short bed trucks. The 9RL features the Best Truck Camper Innovation of 2018, and it’s a tow machine. 70-percent of Truck Camper Magazine’s readership tows something. Would you believe over 38-percent tow a boat? That’s a over one-third of our readership. There’s a reason why our tagline is, “Go Anywhere. Camp Anywhere. Tow Anything.” That’s what we do. There’s an important design element to consider when putting together a truck camper set-up for towing; hangovers. Whoops! I mean overhangs. The overhang of a truck camper is the length of a camper that extends past the tailgate opening. The longer the overhang, the longer the required hitch extension for towing. As you know from reading, “How To Tow With a Truck Camper Rig”, the longer the hitch extension, the lower your towing capacity. For this reason, the sweet spot of truck camper floor length for towing is generally between 8 and 10-feet. Ask most hard-side truck camper dealers and manufacturers which models are their best sellers and you’ll find they’re within this floor length range. Which brings us to the subject of this announcement; Rugged Mountain’s new 2019 Granite 9RL. In short, the 9RL is a Granite 11RL, minus two-feet of floor length. With a floor length of 8’11”, the 9RL actually beats the desired towing sweet spot by an inch. Even better, the center of gravity of the 9RL is 30.25-inches from the front wall. So there you have it. If you love the award-winning tiny-home interior of Rugged Mountain’s Granite series, and you are among the 70-percent of truck campers who tow, the Granite 9RL was designed and built for you. It’s a towing machine, with award-winning tiny-home flair. 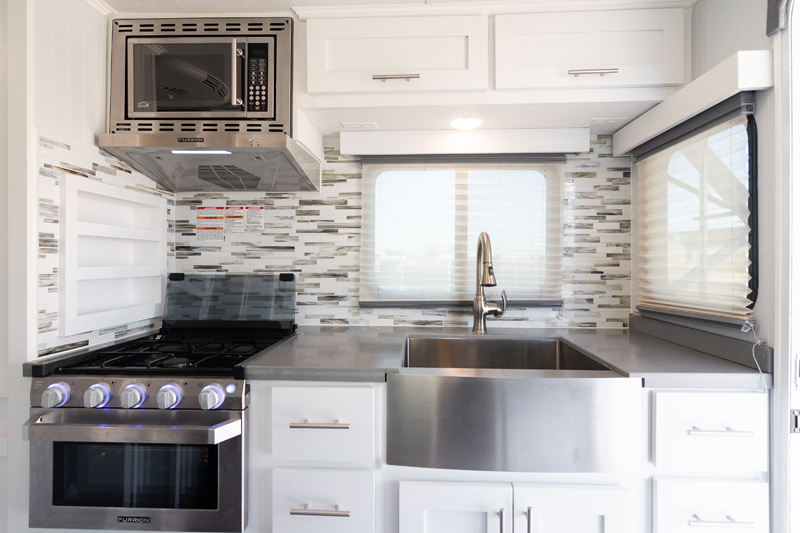 To dig into the back story and details of the 2019 Granite 9RL, we contacted Jesse Collinsworth, Co-Owner of Rugged Mountain RV. The 2019 Rugged Mountain Granite 9RL is a hard side, non-slide, wet bath truck camper made for short or long bed trucks. The interior floor length of the 2019 Rugged Mountain Granite 9RL is 8’11”, the interior height is 6’6”, and the center of gravity is 30.25”. 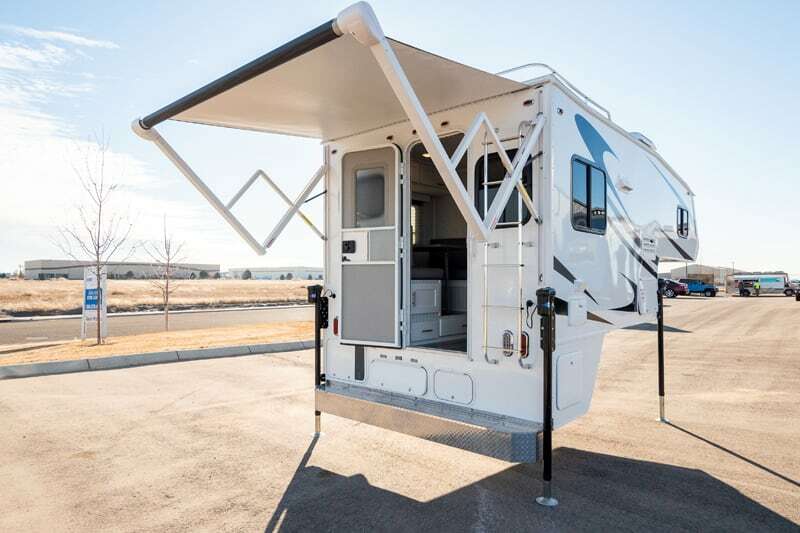 The 2019 Granite 9RL has a 30-gallon fresh tank, a 38-gallon grey tank, a 24-gallon black tank, and a 6-gallon hot water heater. It can accommodate two Group 27 batteries and has two 20-pound propane tanks. Rugged Mountain is reporting the base weight of the 2019 Granite 9RL at 3,459 pounds. The introductory MSRP for the 2019 Rugged Mountain Granite 11RL is $38,270. Above: The new 2019 Rugged Mountain Granite 9RL for long and short bed trucks. All photography courtesy of Rugged Mountain RV. Rugged Mountain RV won Best Truck Camper Innovation of 2018 with the Granite 11RL tiny-home interior. Have you made any changes to the tiny-home interior design for 2019? The tiny-home interior of the 2019 Granite 11RL was dialed-in when we showcased our line at the Elkhart Open House this past September. The only change we have made since is to the tile backsplash in the kitchen. On the prototype and first run of the 11RL campers we used tile and mortar. To reduce weight, we are now using a residential-quality sticky-back tile. The sticky-back tile is significantly lighter and a lot more flexible. The look is fantastic. The rest of the Granite tiny-home interior is exactly the same. We didn’t want to change the interior that just won Best Truck Camper Innovation of 2018. When the Granite 11RL debuted last year, nobody knew how the tiny-home look would be accepted within the truck camper market. Then RV Pro awarded it a Best In Show at the Elkhart Open House, and our readers gave it a Best Truck Camper Innovation award. What do you think is behind the tiny-home appeal?